• الموضوع : Dr Mohamad Ali ElHusseini meets Rabi Zalman and calls for activating the values of tolerance between Muslims and Jews . Mr. Mohamad Ali El Husseini, met with Braby Zalman, National Director of “Together for Humanity”, in which they discussed together the overall Jewish and Islamic relations. 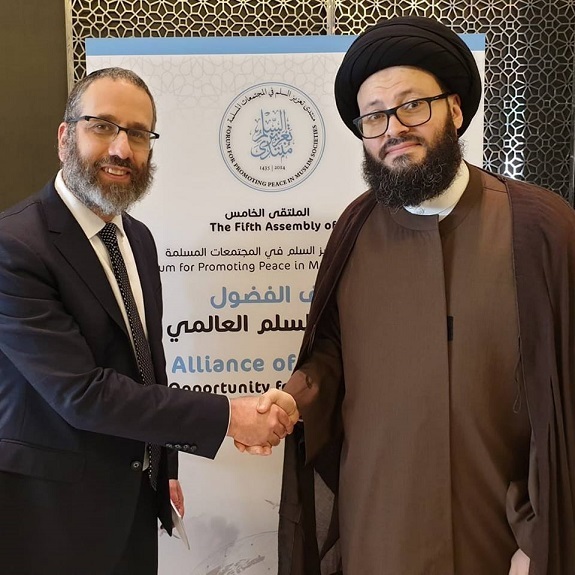 Dr ElHusseini discussed with Zalman on the sidelines of the conference of the peace forum held in Abu Dhabi, ways of bringing together the Abrahamic religions which came in order to achieve peace for all humanity. The Secretary-General of the Arab Islamic Council called for intensifying efforts among the followers of Islam and moderate Jews to spare humanity a lot of tragedies due to hatred and to deepen the importance of spreading the values ​​of love and peace among all religions.